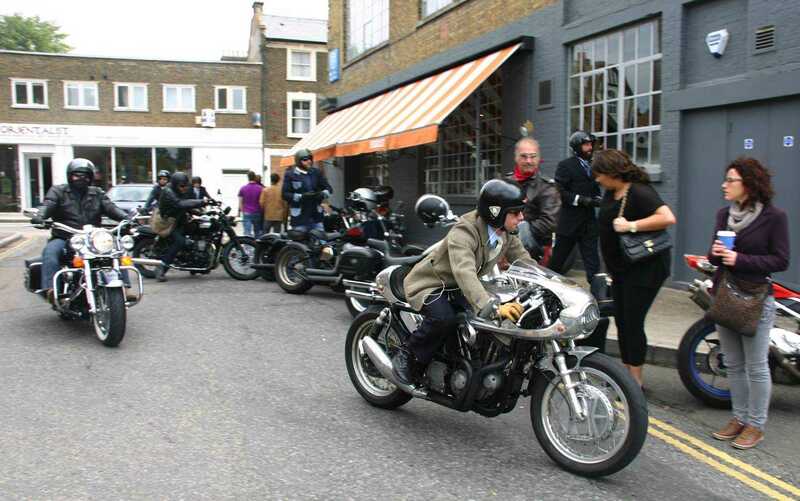 A few years ago I was chatting to Mark Wilsmore, the Ace Cafe impresario, and I asked him why there were so many four-wheel events at a biker caff. 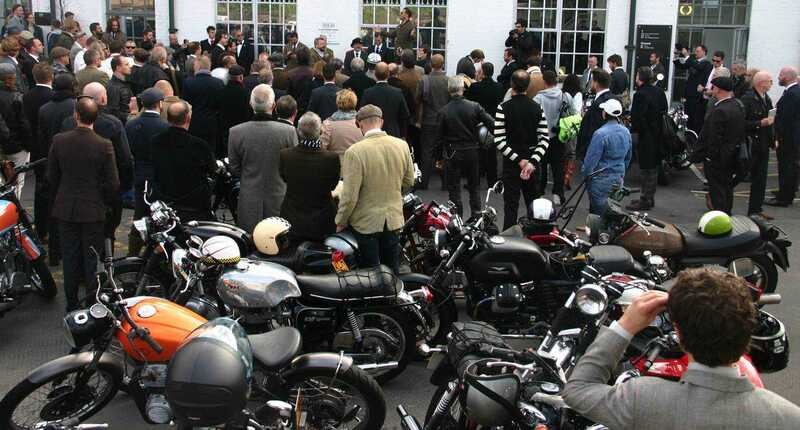 Mark was clear that a lack of passion for bikes among young people – coupled with outrageous insurance costs – had resulted in a shift in the biker demographic. 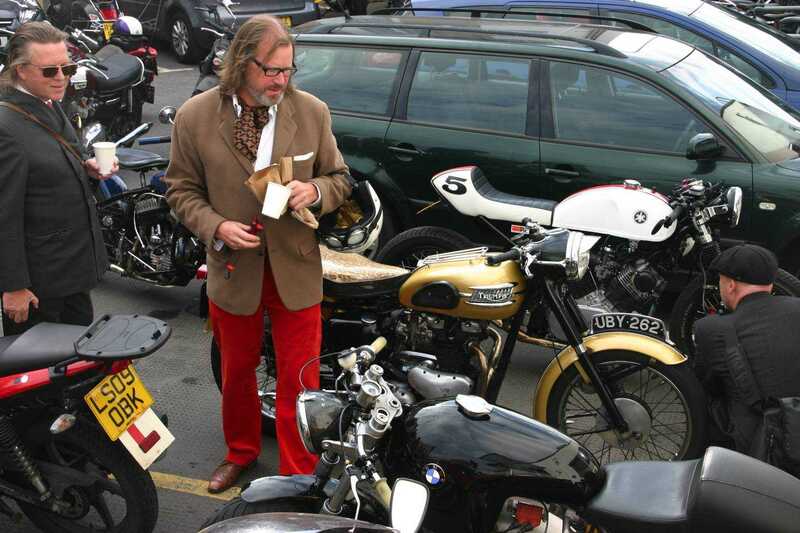 Simply put we were getting older and dying off, and young motorcyclists were becoming a thing of the past. He needed to have car stuff at the Ace to make the business work. 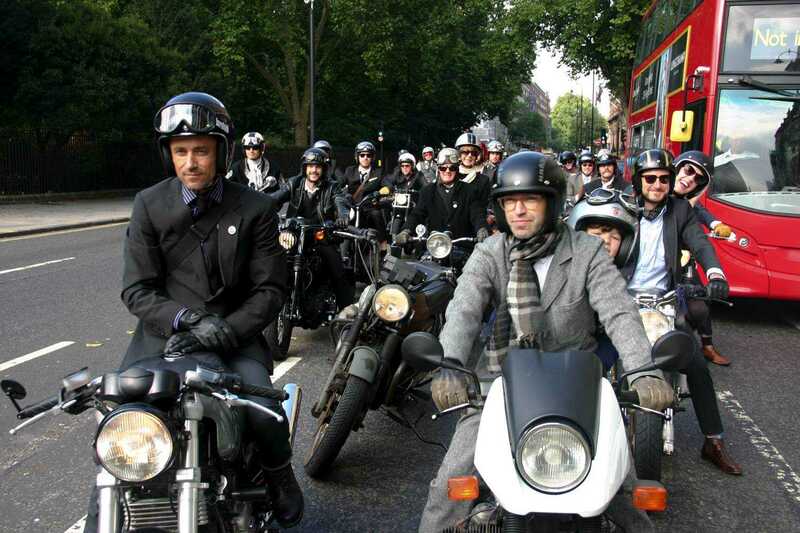 Then, more recently I switched on BBC4 and watched a documentary about rockers in the 50s (which coincidentally featured Mark) and when I saw black and white footage of those rebels riding out from the Ace it was very reminiscent of the Distinguished Gentleman’s Ride this September. Except for the riding attire that is. 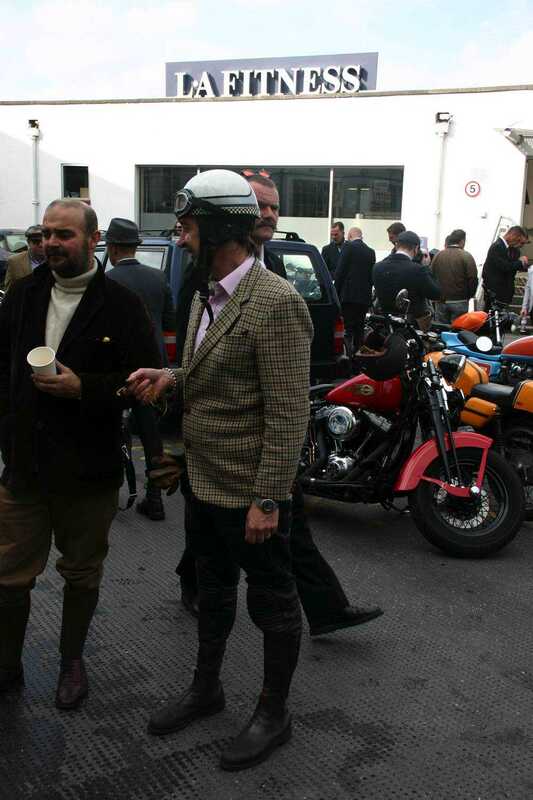 Back then they were rebels without a cause; black leather jackets, blue jeans and jackboots were the standard uniform, whereas today we were asked to don our finest tweeds. 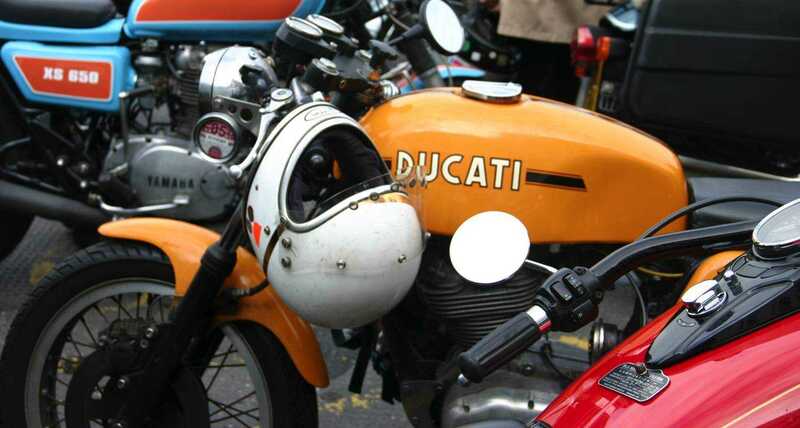 In the fifties there were few helmets, on the run there were only open face lids, which is a kind of statement in itself. 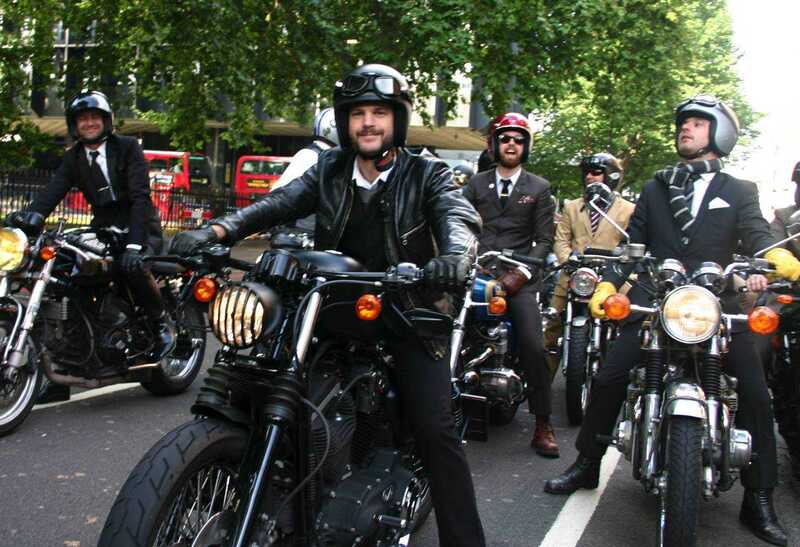 Brilliant, how could anyone object to a load of toffs on bikes? 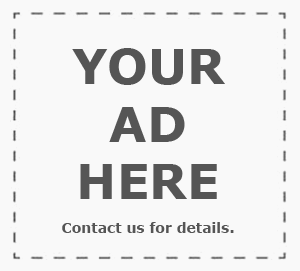 The public at large are more likely to gawp and love seeing them. 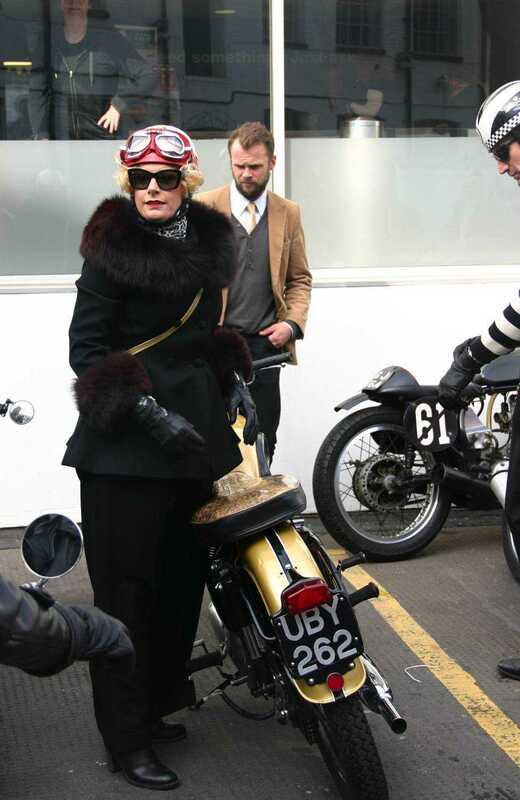 And what better way is there to draw attention to the new wave of young hipster custom bikers than to ask 300 of them to dress up like something out of Downton Abbey and ride en masse through the Capital? The ride also raises money for men’s health and after 2,500 riders took part in 64 cities in 2012, this year’s event happened simultaneously in 110 cities and involved 5,000 riders. Next year they predict 150 cities and 8,000 bikes, such is the positive power of the web. 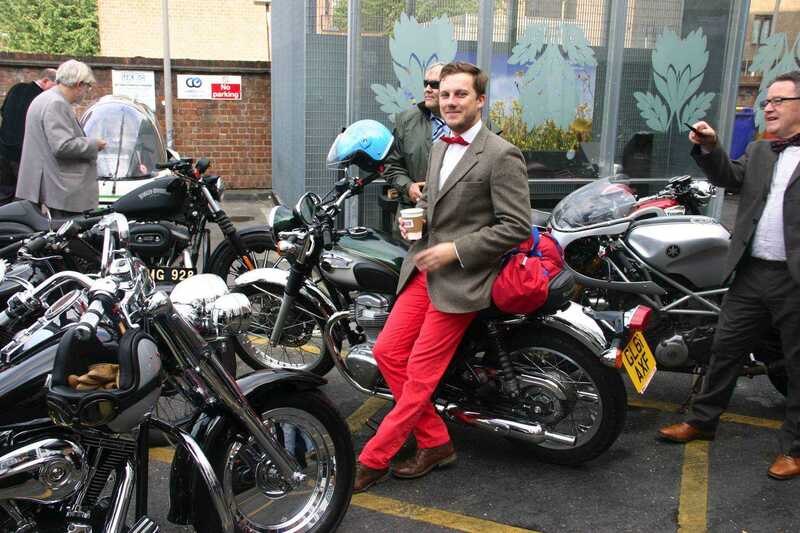 The idea as they say on the website is to have fun, live tweed and ride dapper, and it’s the perfect occasion to show off your current bobber, street tracker, brat bike or whatever they call a touch of individuality in the trendier parts of the Metropolis these days. 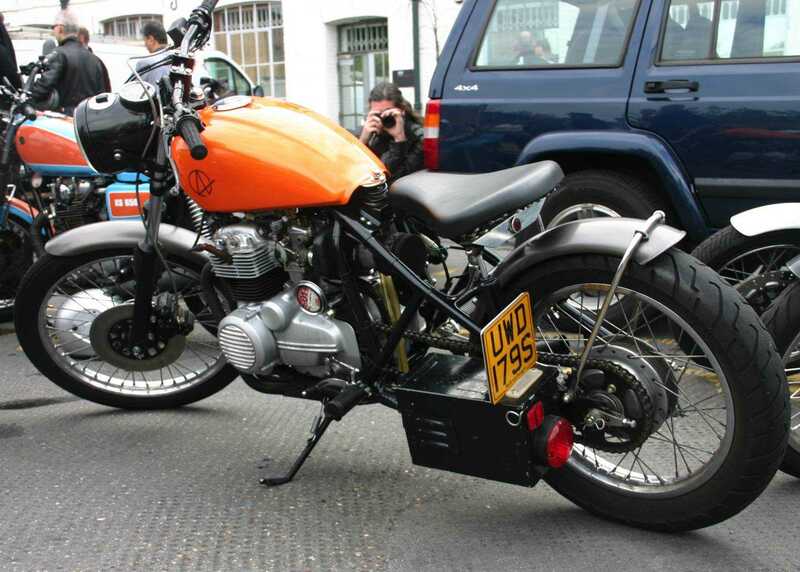 The ride showcases the trend towards basic bikes with personal style that you can maintain in your shed or garden with ordinary tools and without the need for a diagnostic laptop. Even the big manufactures have acknowledged that bikes are getting too complicated. My mate Matt had a 12,000-mile service on his Aprilla last week, it required an oil change and the tappets checking and the bill was six hundred quid! 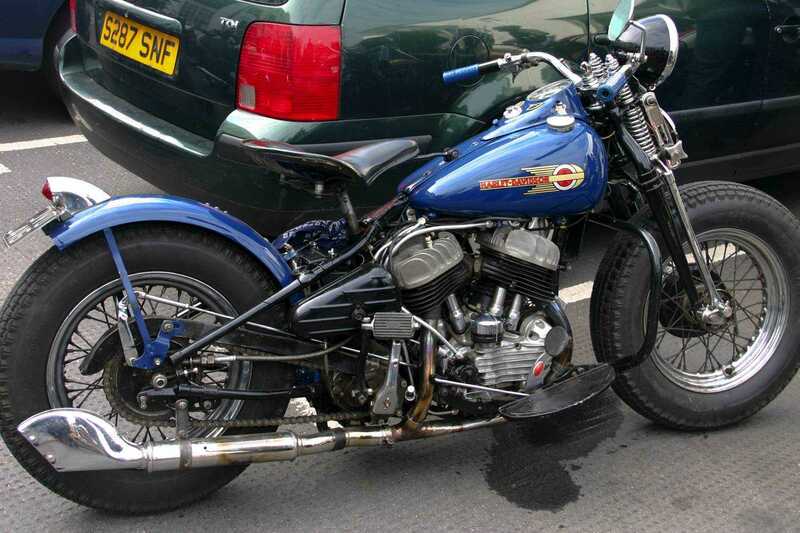 You could pick up a halfway decent old school Honda or Yamaha for less than that. 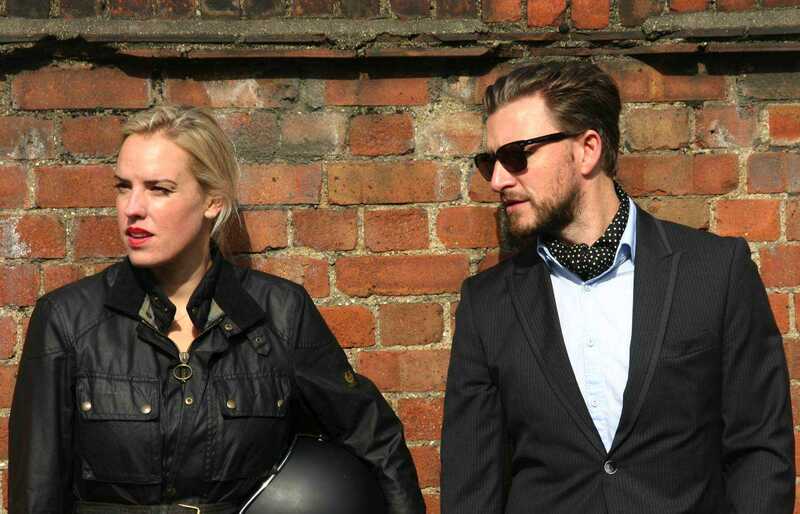 The Bike Shed MC based in Shoreditch, epitomises the new wave of hipster bikers striving for originality and individuality. Heard that one before? It’s already showing signs of developing into a significant market and I believe it will become an increasing part of the mainstream, which seems like such a positive result coming out of these austere times. There are now loads of artisans out there buying up 70s semi-classics, chopping them and creating works of urban art. 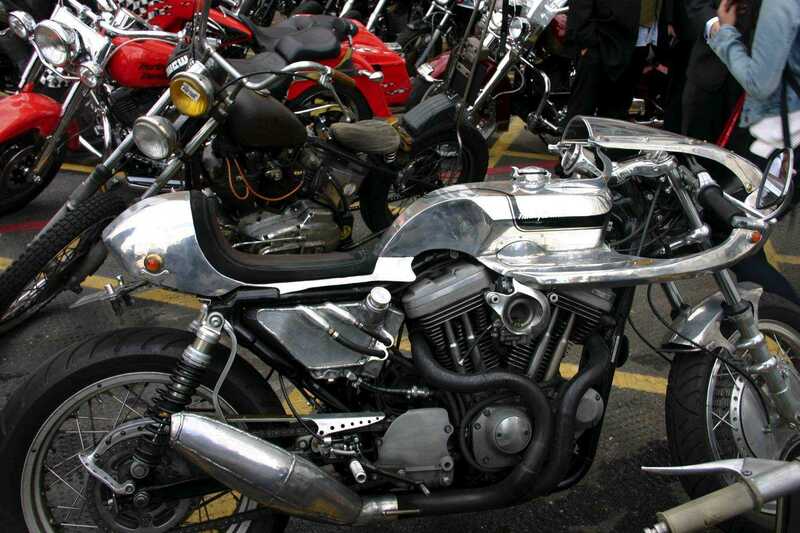 You can see their creations showcased at The Bike Shed Events (the popularity of which seems to be growing exponentially). 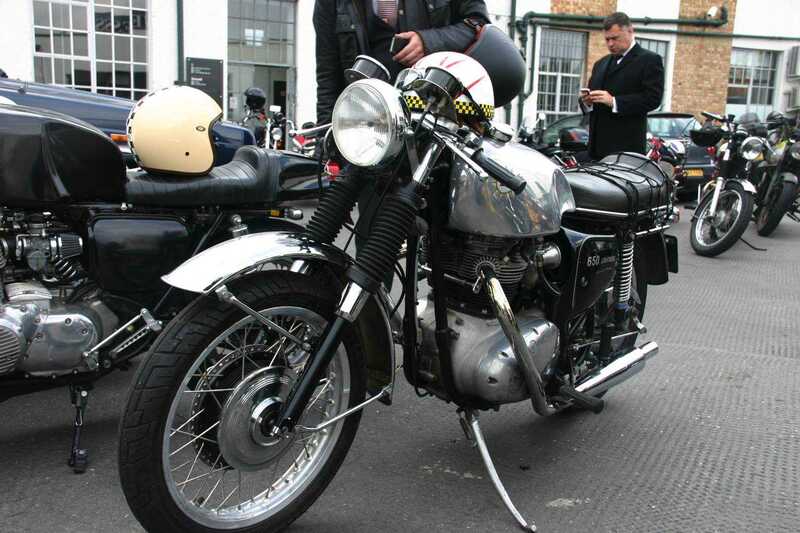 However, static shows are all well and good but for me it’s all about riding and the DGR is all about that. The bikes gathered in the car park behind a trendy burger joint in Highgate Road on a sunny Sunday morning in September. 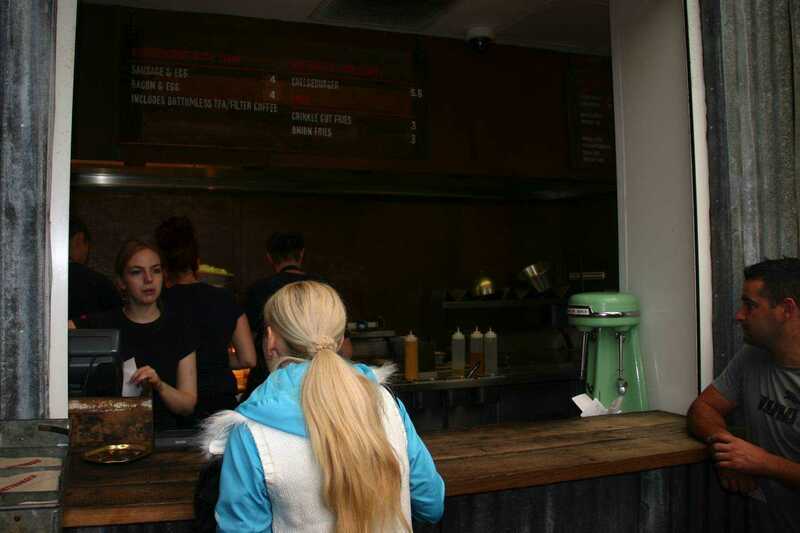 The Dirty Burger is worth a mention, trust those Hoxton Hippies to know about cool eats and the DB is right up there with the trendiest and tastiest – check them out in Kentish Town and their new place in Vauxhall. 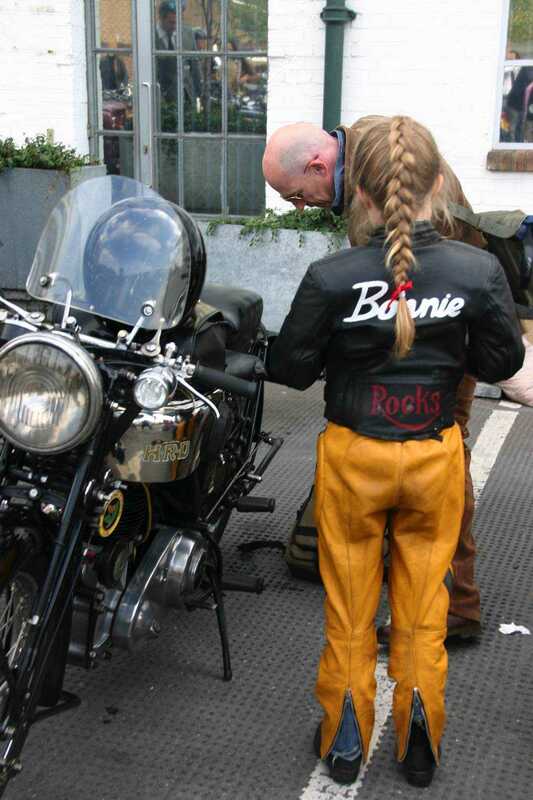 We were all tweeded up and after an hour of drooling over resting bikes the magic moment arrived. 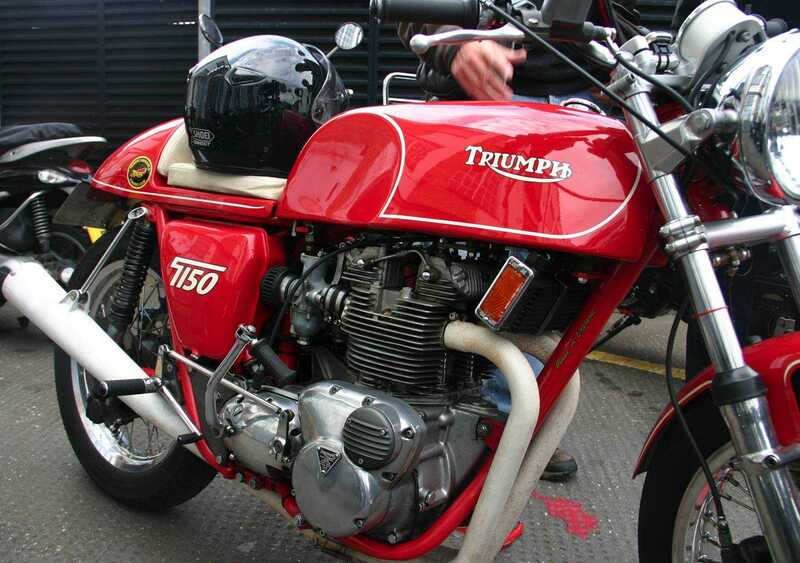 It only required a nod from our tweedy leader and three hundred mainly air-cooled four strokes roared into life. I cannot describe the beautiful noise, it just had to be heard and experienced live. 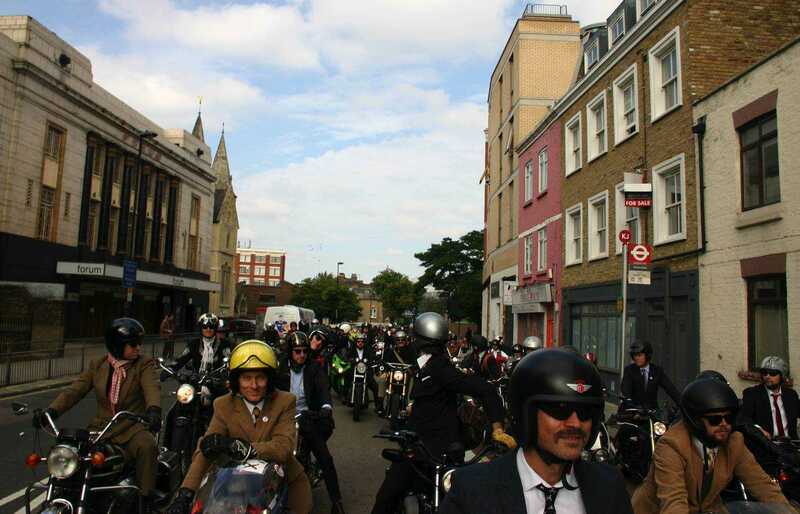 Rules is too strong a word but we all followed the guidelines: open face helmets and gentlemanly attire. 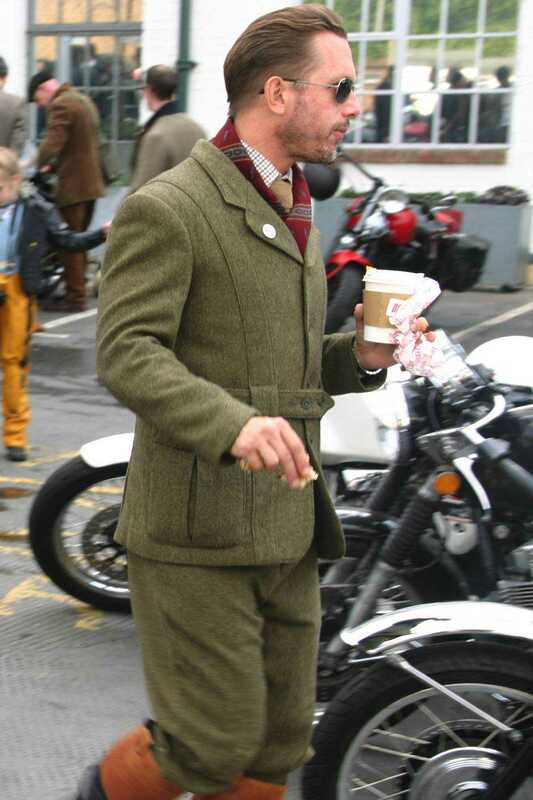 Several ladies too were sporting that ever so British cloth – tweed. I reckon it’s as good as any modern textile for abrasion resistance and my thirty year old Harris Tweed sports jacket would protect me from road rash. There were to be no burnouts or wheelies; just ride like gentleman was the instruction and we all did. We made our way to the river via Camden and Bloomsbury riding two or three abreast and crossed at Waterloo, my favourite London bridge. We were chatting along the way about all the usual bike stuff. 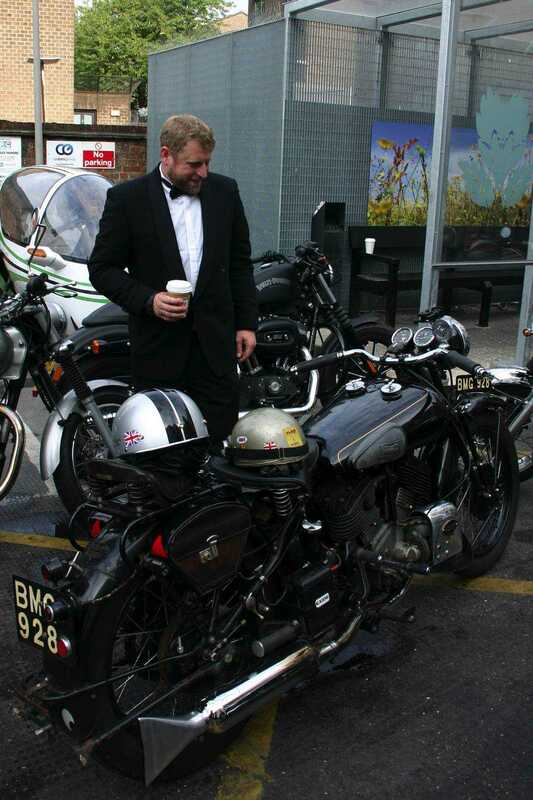 At one point I found myself alongside Eric and Catherine Patterson on their wonderful Brough Superior. Eric had just come back from flying the flag at Bonneville and collecting some new land speed records on Mark Upham’s Brough. Each time we stopped for lights or regrouping the opportunity arose to socialise. 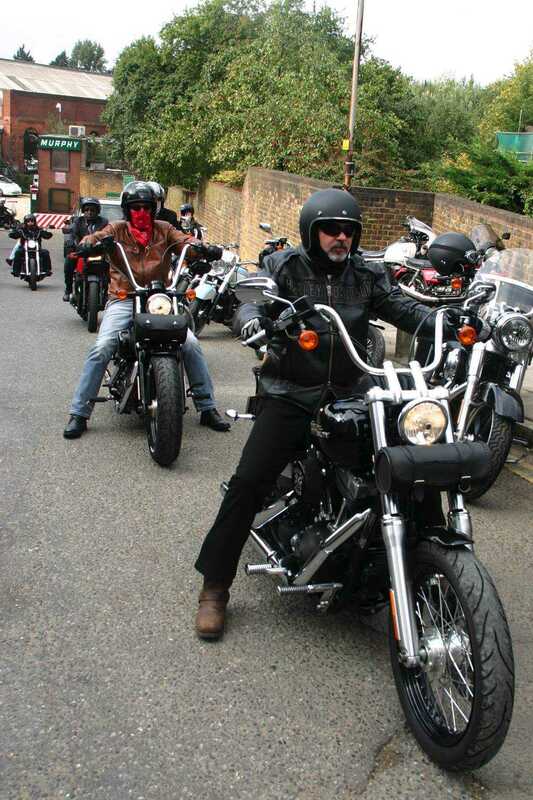 I am not one for group riding; I feel uncomfortable being paced by mates and am tempted to take the lead and race. But this was different, this was a leisurely procession where we chatted, stopped, hopped off and took pictures. From Waterloo we followed the river west, headed north again across Lambeth Bridge, turned onto the Embankment and then rode along a stretch of the Kings Road before crossing back over the river at Wandsworth to arrive at our destination, a riverside pub called The Ship. The group managed to stick together all the way by some great unstated form of organisation. I didn’t see a single copper but would have been fascinated to see their reaction to this bunch hogging Boris’s bike lanes. I honestly couldn’t imagine them reacting in the same way if they had been three hundred back patch members. 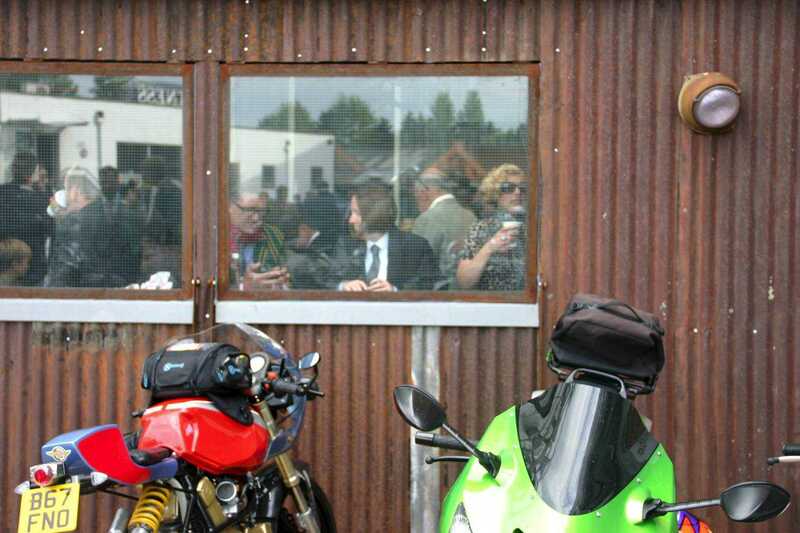 I reflected on the day and the emerging motorcycle demographic over a pint of Youngs. These were not older folk riding vintage machines on the Banbury Run as the name of the ride suggests, but young creative trendies hanging up their skateboards and riding chopped versions of the bikes that I spent my teenage years on. 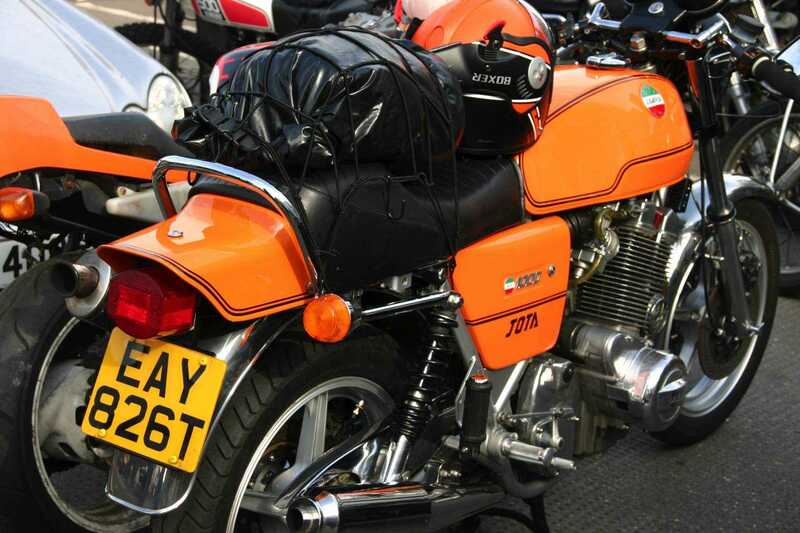 I wonder what sort of reaction chopped CX500s and 400 Superdreams would have got back in the day? 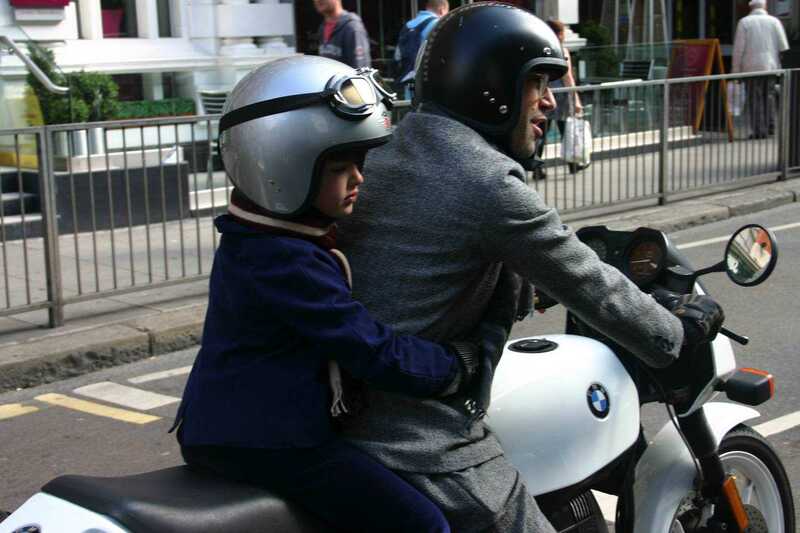 If you doubt that this is a growing trend check out the latest Internet ad for the BMW RnineT. 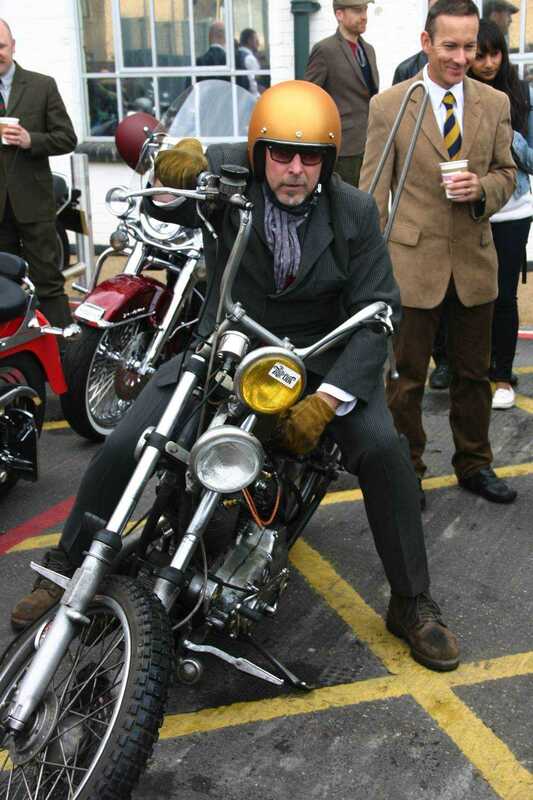 The bike is designed to be customised to the owner’s choice with thousands on bolt on and off options and it is ridden by a bearded Shoreditch Amish type through what looks like a SoCal desert amongst half a dozen similarly cool, slightly camp mates on 70s bikes, typical of the ones on the DGR. 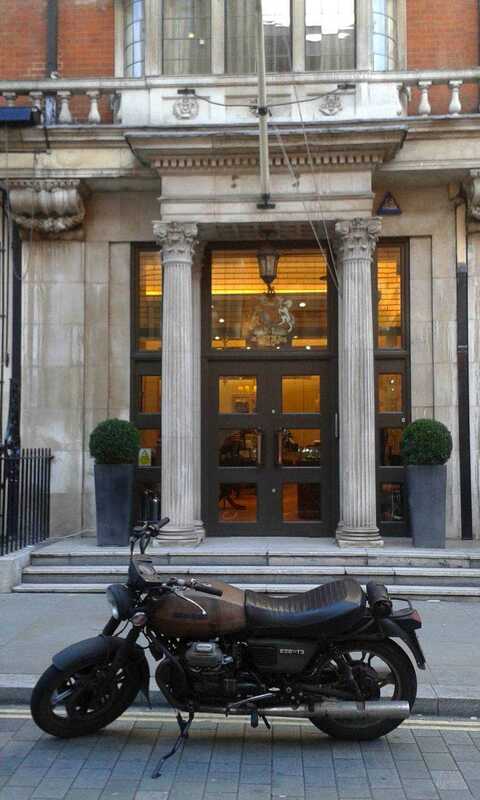 It would appear that one of the world’s most successful motorcycle manufacturers has identified a need and is attempting to meet it. 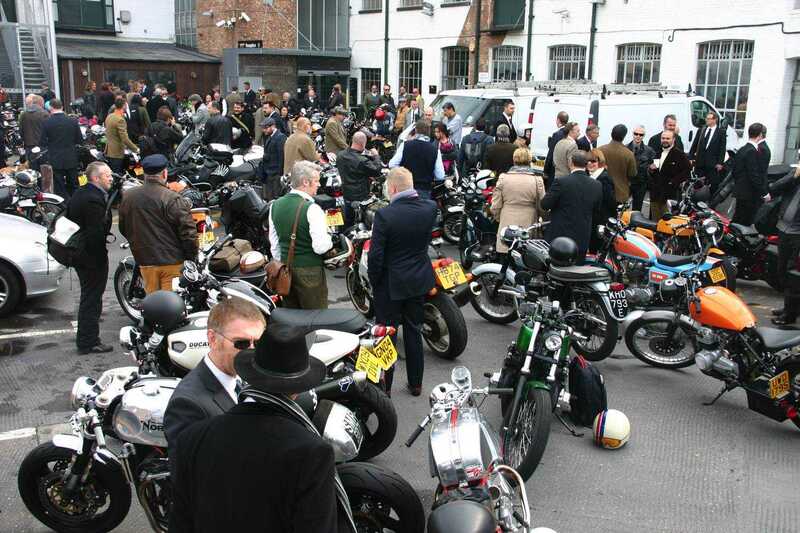 The Distinguished Gentleman’s Ride and the BSMC, have met that need and both are going to grow and grow. Check out the video on YouTube and be there next year. What a fantastic day! 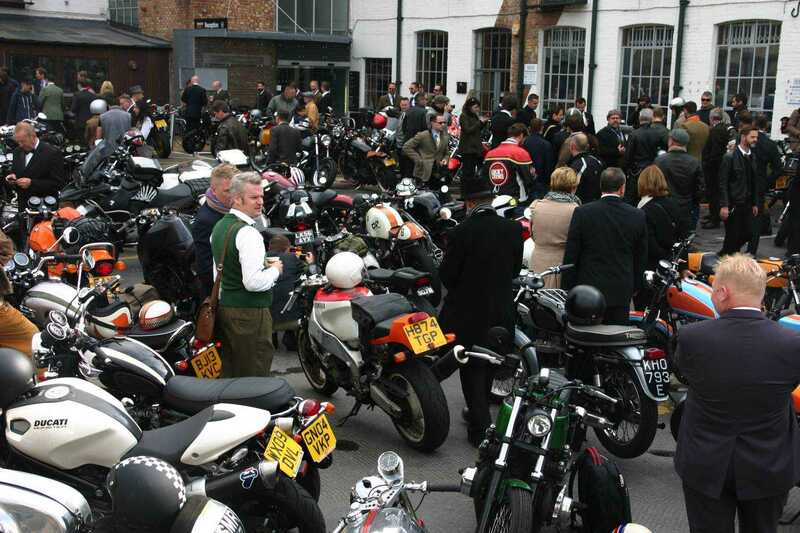 I can see myself and my bike in a few pictures as well! Great day and well worth the long round trip from Bath to participate. Here’s to the 2014 event! You do know there was one at Taunton? And there will be next year as well. There’s a link to the DGR at the bottom of the article Ryan, why don’t you contact them (it would be great to see some pictures if you manage to get it together). This looks like an amazing day. I would love to do it next year, must raid the charity shops to get toged up!